Map of Tikal National Park, Guatemala, with the soil pedon locations identified with crosses. Elevation shades are in meters above mean sea level. After emerging sometime before 1000 BC, the Maya rose to become the most advanced Pre-Columbian society in the Americas, thriving in jungle cities of tens of thousands of people, such as the one in Guatemala's Tikal National Park. But after reaching its peak between 250 and 900 AD, the Maya civilization began to wane and exactly why has been an enduring mystery to scientists. The findings are just the latest example of how invisible artifacts in soil—something archeologists literally used to brush aside—can inform studies of past civilizations. That's because artwork and buildings can crumble over time and jungles will eventually conceal ancient farm fields, but "the soil chemistry is still there," Terry says. The full article is available for no charge for 30 days following the date of this summary. View the abstract athttps://www.soils.org/publications/sssaj/abstracts/0/0/sssaj2010.0224. Debate over agricultural methods and productivity during the Preclassic and Classic Maya period (1000 BCE to 900 CE) focuses on the agronomic utility of both upland and lowland soil resources of the karst topography characteristic of northern Guatemala and much of the Yucatan peninsula. In settings where direct evidence of agriculture is sparse, stable carbon (C) isotope evidence from soil organic matter (SOM) provides information on past vegetation changes related to ancient maize agriculture. Areas of ancient sustained maize cultivation can be identified in an ecosystem dominated by C3 forest vegetation because of the unique C4 photosynthetic pathway of maize. The decomposition of plant materials with divergent photosynthetic mechanisms (C3 versus C4) results in SOM with correspondingly distinct stable C isotope ratios (δ13C). Such differences are preserved and detectable within the refractory humin fraction of the SOM. 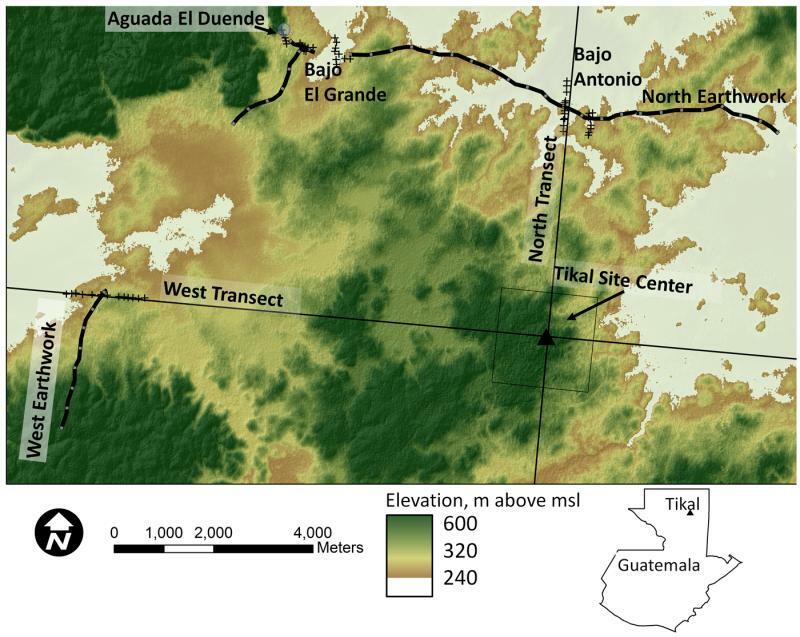 This study analyzes the physical and chemical soil properties including stable C isotopes of soils collected from upland and lowland locations near Tikal, Guatemala. Toeslope soils contained strong isotopic evidence of C4 vegetation likely the result of ancient maize agriculture, while the evidence from shallow soils of the summit and backslopes was less conclusive. In both upland and lowland contexts, however, the stronger evidence of ancient vegetation shifts associated with maize agriculture was found in the deeper fine-textured soils in the footslopes and toeslopes. Examination of soils on toeslopes revealed evidence of deposition from erosional processes upslope that may have been related to the spread of agriculture to less productive soils over time.